On December 17, 2010, the self-immolation of Mohamed Bouazizi sparked a popular uprising on the streets of the Tunisian capital of Tunis. 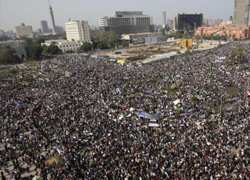 By February 11, 2011, the desire for the rule of law, democratic representation, and respect for human rights had spread across the region and led to the ouster of Egyptian President Hosni Mubarak. And on March 19, 2011, the United Nations Security Council passed Resolution 1973, invoking the responsibility to protect and instating a cease-fire over Libyan airspace. These three months marked a tumultuous period in the Middle East and a dynamic period for international law. Despite the fact that these revolutions took place thanks in large part to the internet and social media, it became apparent that there was no ongoing, real time conversation about the international legal implications of the “Arab Spring.” The View From Above was created to fill this void by starting a discussion about all issues of public and private international law and foreign policy. The View From Above is a Denver-based online publication dedicated to creating a forum where practitioners, professors and students can share ideas, debate and engage in an ongoing conversation about international law and foreign policy. In the long term, The View From Above aspires to become the primary online publication for high-level discussion on current international law developments as they occur. Through the use of the internet and social media, we hope to disseminate information in a meaningful way in order to bridge the gap between academics, practitioners, policymakers, and students. The View From Above hopes to advance the practice of international law by making the discussion of international legal issues as responsive to the rapidly changing landscape as technology will allow. We invite you to join this vibrant online community by commenting on our posts. Whether it is to register an opinion, compliment or criticize a submission, or respond to others’ comments, your feedback is an integral part of TVFA realizing its full potential. We only ask that you abide by our comment guidelines. The View From Above is a collaborative effort between the Ved Nanda Center for International and Comparative Law and the Denver Journal of International Law and Policy. None of this would be possible without our contributors.